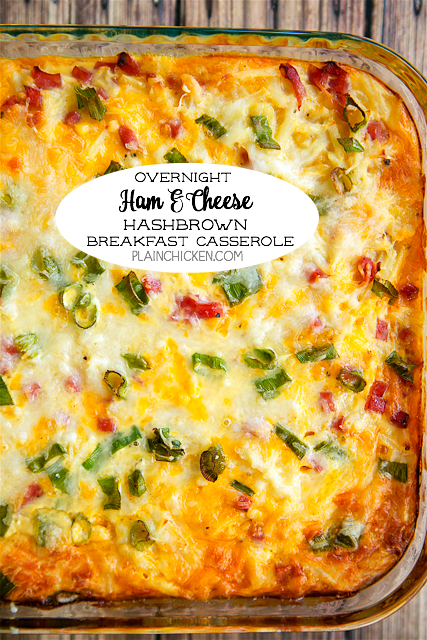 Overnight Ham and Cheese Hashbrown Breakfast Casserole - hash browns, cheese, ham, green onions, eggs, evaporated milk - mix together and refrigerate overnight for a quick breakfast. Great for overnight guest and the upcoming holidays! I'm not really a morning person. If I'm making breakfast, it has to quick and easy. 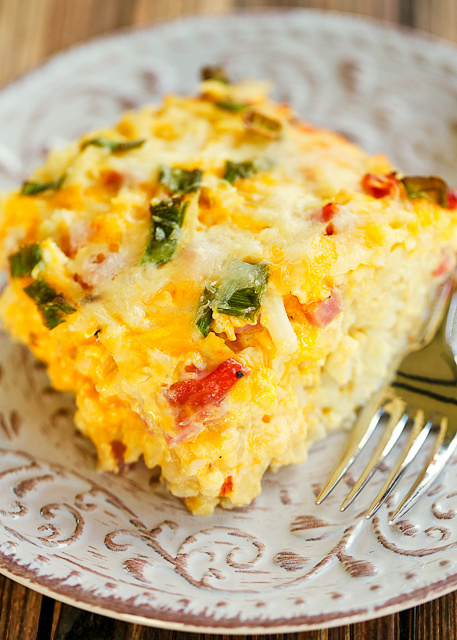 This Ham & Cheese Hashbrown Breakfast Casserole fits the bill. It can be assembled the night before and baked the next morning. I've even made the the night before and baked it the next night for dinner. We love breakfast for dinner in our house! 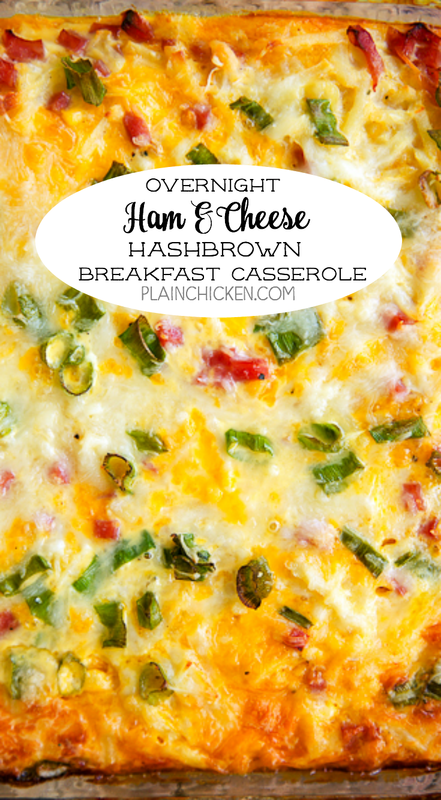 This Ham & Cheese Hashbrown Breakfast Casserole was a huge hit. It is loaded with ham, cheese and green onions. You could even add some bell pepper and mushrooms. Chicken Legs is still talking about how good this was. We ate this for dinner, but it is perfect for overnight guests, brunch or early football games. I'm planning on making this for Thanksgiving morning. 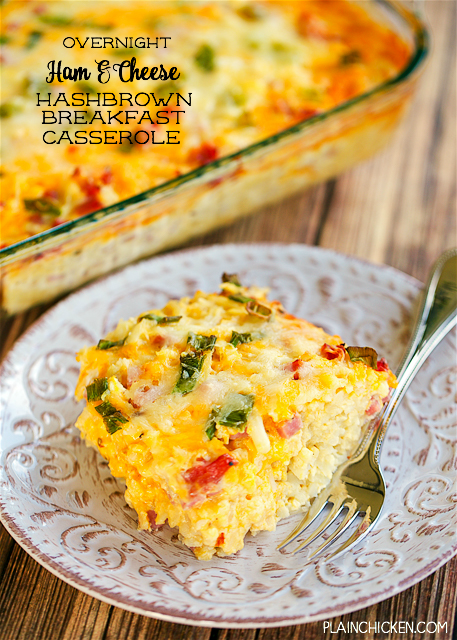 It is the perfect holiday morning casserole! Lightly spray a 9x13-inch pan with cooking spray. Set aside. Mix together hash browns, ham, green onions and cheese. Spread into prepared pan. Preheat oven to 350ºF. Bake casserole for 55 to 60 minutes, until set. Do you have to thaw the frozen hash browns first? Hi Jenny! She doesn't list the hash browns as thawed in the ingredients or instructions, and since this cooks for almost an hour, I'm going to go with no. You throw them in frozen. That's my guess. And oh my does this look amazing! Do you really only use 4 eggs for a 13x9 casserole? Most recipes call for at least 8.